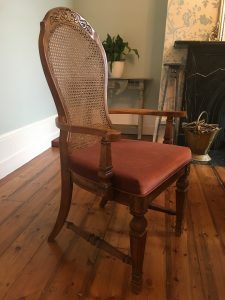 This is my post on how to reupholster a chair, and generally upcycle it. If you can’t see the video please click here. It was taken from a Facebook live stream so apologies for the poor quality. The dining room has been one of the final rooms to receive its finishing touches. One thing for sure was that the furniture was going to have to go. I sometimes wish I was the kind of person that could just pop along to a shop that sells new stuff and buy something! Alas, instead I spent weeks searching Ebay and Gumtree for the perfect set. I couldn’t resist these chairs as I immediately saw their potential. Anyway, I thought you might all like to see how easy it is to upholster dining chairs. Painting was a necessary part of the upcycling process as well. I’ve been there and done that with kitchen chairs though so I was keen to find a quicker method this time. 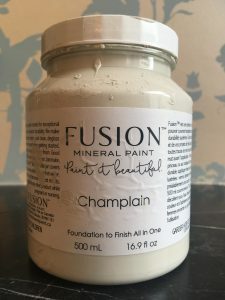 I was thrilled to discover a paint I hadn’t come across at my local Vintage Attic shop. The great thing about this acrylic based paint is that it doesn’t need waxing like chalk paint, but you still get a really nice matte finish. 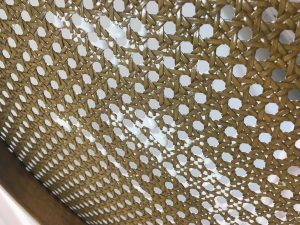 You also have minimum prep time – no need for sanding. I just used sugar soap to remove any grease beforehand. I used their concealer paint as an undercoat. This is made of 100% recycled pigment so is cheaper but makes a great base. I then went for Champlain for the top coat as it went really nicely with the duck egg of the walls. This stuff is great to work with. It’s a lot more fluid than chalk paint so kinder on the arms and wrists. It also self levels, so you need to make sure the base coat is neat. I was satisfied with one base coat, one top coat and one set of touch ups in the odd area. 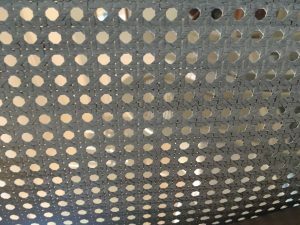 If you have furniture with wicking like this, just make sure you check both sides regularly. The paint is fairly runny so it might be dripping on the other side without you realising. The pads were a ghastly shade of faded red. They were still in fairly good condition though so I decided to just reupholster them. 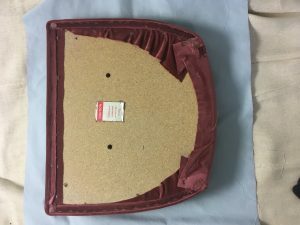 Place pad in the centre of your fabric. Allow for about 10cms of excess. 2. 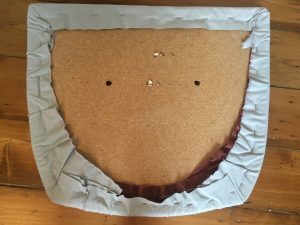 Staple or pin in the centre of all four sides first. 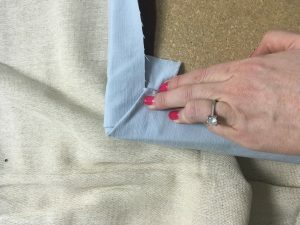 Make sure the fabric is taut and smooth. 3. 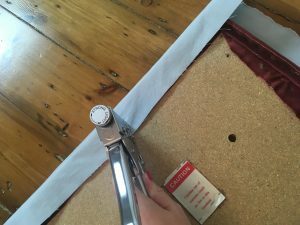 Using the same technique you might use for tucking in bed sheets, fold the corners and staple. Make sure this is done symmetrically. 4. Finally staple all the way around, again making sure it’s taut and smooth on the top side. 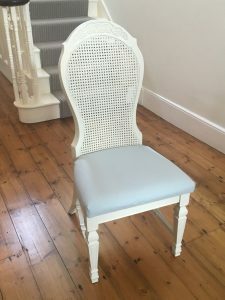 I was really thrilled by the end result and think they look like really expensive, chic chairs now. 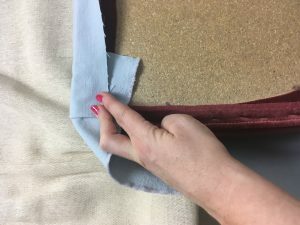 One tip is to keep some of the fabric so if they get marked you can just cover them again! 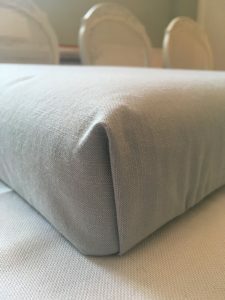 If your house is overrun with kids or animals you could always use waxed fabric as well. Also before you embark on this project check the pads come away easily. Mine were just screwed on so could quickly be removed and replaced. If you’ve done your chairs and want ideas for a table here’s my post on upcycling a pine table.